Voice croaky, heart pounding, sweaty hands, light headed… it's hard to get away from it, but most people have to make presentations or speak in public at some stage in work or college... and for some, it fills them with dread. Nervousness is perfectly normal in the right circumstances, but when anxiety attacks are frequent or unexplained every time you have a meeting or need to present, it's time to get help. Contact us today to make an appointment. The fear of speaking in public, whether it is in work situations, presentations at college or social situations, can often result in panic attacks for some people. Panic attacks usually manifest as an unexplainable feeling of nervousness which quickly develops into a full blown anxiety attack. The classic symptoms for sufferers include: palpitations, shortness of breath, sweaty palms, tingling sensations, sweating, headaches, feeling light- headed, stomach upset, fear and feeling hot or cold. 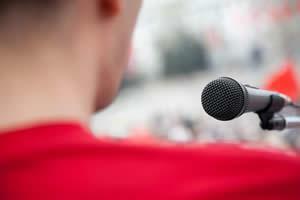 We recommend 3-4 sessions for overcoming the fear of speaking in public. After 2 sessions, your anxiety, which is the root of the fear of speaking in public, will be dramatically reduced if not entirely removed. The other sessions are to ensure that the fears are removed permanently. The first two sessions are about a week apart and the following sessions are spread out a little longer. First you'll be given a thorough explanation of how hypnosis works and how the mind works. Then you'll be informed in detail that the fear of speaking in public and anxiety or panic attacks are a product of the subconscious mind. Hypnosis is the only effective tool to deal with the subconscious mind. Although anxiety or fear of speaking in public can be controlled by some medications, the more open-minded doctors are referring their patients for hypnosis to help them completely remove panic attacks from their lives for good. If you are ready to move on with your life and get rid of the fear of public speaking contact us today to make an appointment at our Galway, Athlone or Ennis clinics.